Invited to take part in Potsdam | Montreal, a two-month residency in Montréal, Cyril Baldy and Tilman O’Donnell straightened their artistic links and explored new approaches in Circuit-Est centre chorégraphique studios. 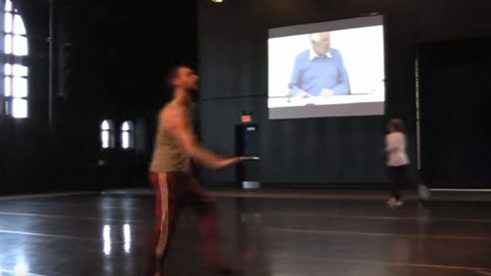 On December 10 and 11, 2014, they presented the result of these explorations and reflexions during a “Whateverness marathon”, divided in 20 minutes sessions, in which some artists from Montreal were invited to participate. We had the chance to interview both about their conception behind this “marathon” and about the creative process in contemporary danse. Born in France, Cyril Baldy studied in Paris at the Conservatoire National Superieur. Worked with The Jeune Ballet de France, Nederlands Dans Theater (NDT) II and NDT I before joining Ballett Frankfurt in 2002. Member of The Forsythe Company since 2005. Born in USA, Tilman O'Donnell trained at the National Ballet School in Toronto (Canada) and joined The Göteborg Ballet under the direction of Anders Hellström. In 2002 Tilman danced at the Staatstheater Saarbrücken directed by Marguerite Donlon. Thereafter he joined the Cullberg Ballet under the direction of Johan Inger from 2003 until 2007. Tilman is a member of The Forsythe Company in Frankfurt since 2007.